Belgium has had a lovely tradition of December royal weddings, and tiaras like today's piece -- the Spanish Wedding Gift Tiara -- often arrived in their royal vaults right at this time of year. 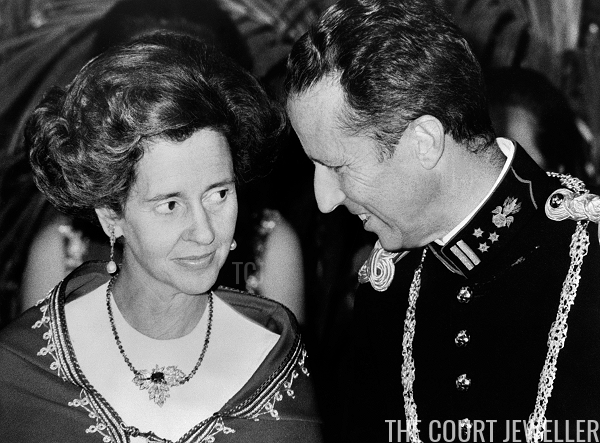 The Spanish Wedding Gift Tiara, as its name suggests, was given to Queen Fabiola of Belgium by the then-leader of Spain, Generalissimo Franco, and his wife, Carmen. The Spanish head of state gave the new queen a tiara because she was born into an aristocratic Spanish family: her maiden name was Doña Fabiola de Mora y Aragón, and her godmother was Queen Ena of Spain. 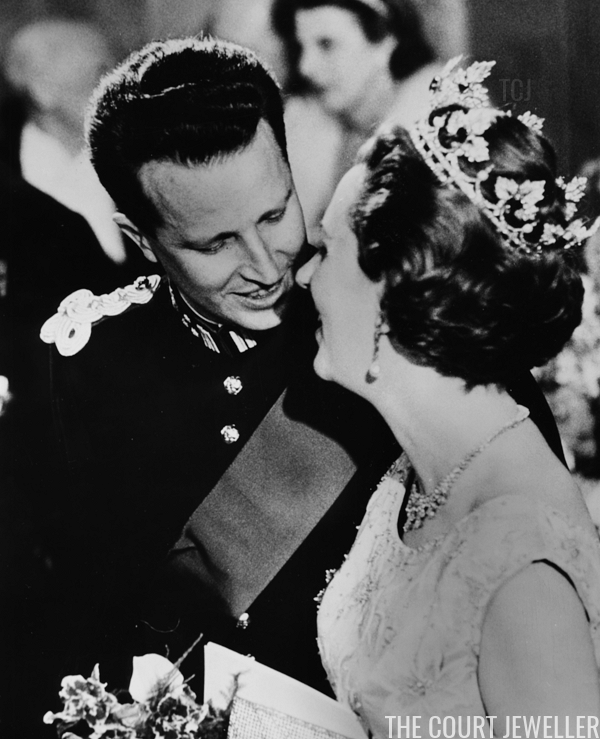 Carmen Franco delivered the tiara to Fabiola on December 6, 1960. The piece can be worn not only in three different configurations but also with three different sets of colored gemstones. 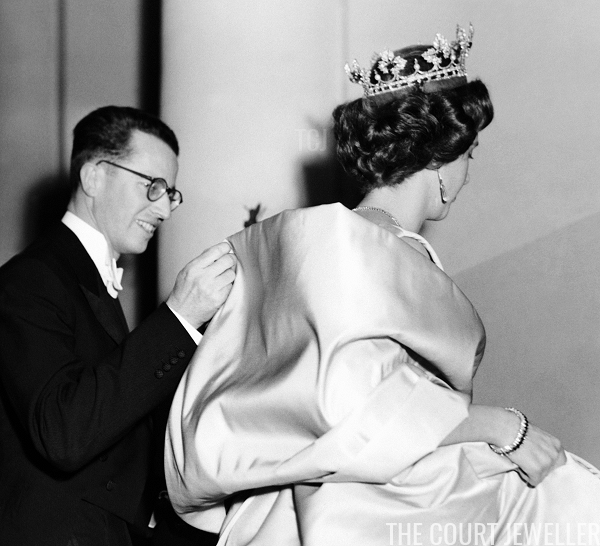 The tiara is a feat of construction, endlessly adaptable and yet still balanced and lovely. It can be worn as a large but elegant wreath tiara. The leaf elements can also be worn upright, transforming the piece into a coronet. 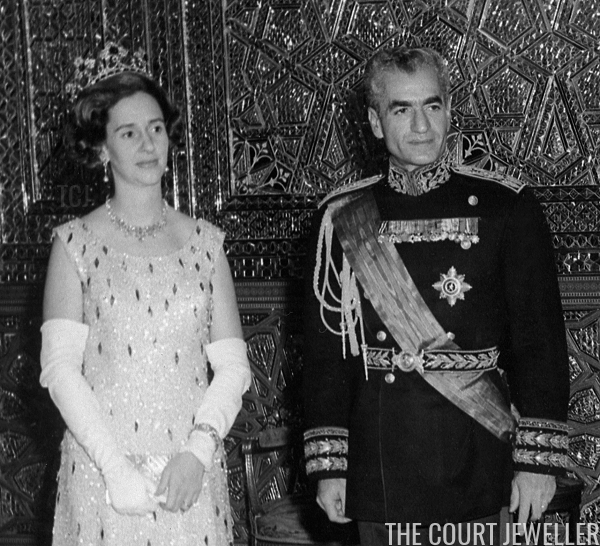 Fabiola wore the tiara in this coronet setting for an official visit to Iran in November 1964. 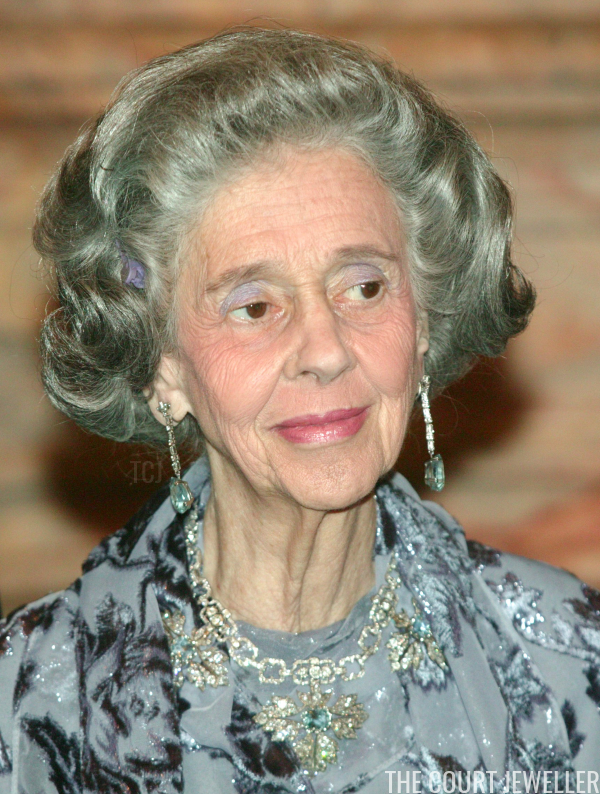 Even better, Fabiola also wore the elements as pendants on a necklace; she's wearing one of them on her necklace in the photo above, from a 1978 reception in Brussels. The center of each diamond leaf element is studded with a gemstone, and those too are interchangeable. The piece can be worn with rubies, emeralds, or aquamarines. 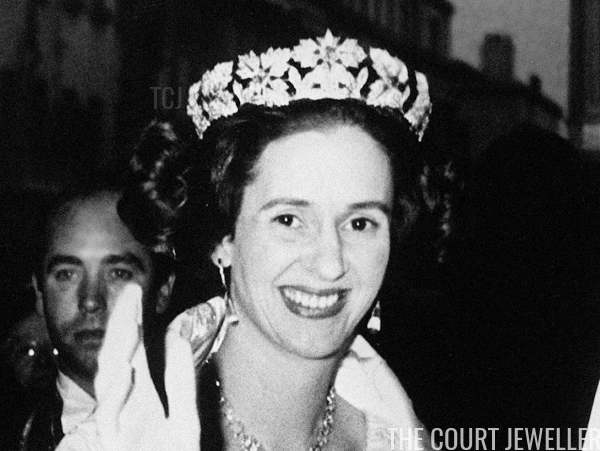 Add in Fabiola’s impressive bouffant, and you’ve got a truly remarkable tiara. 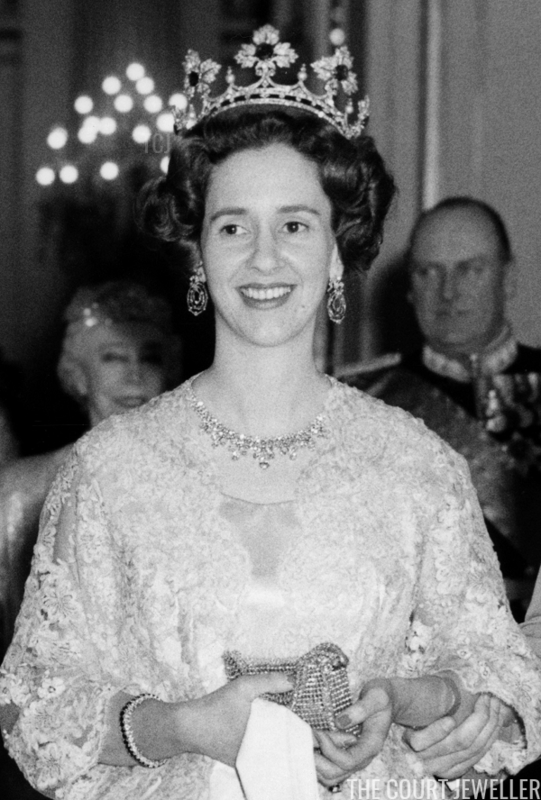 Fabiola continued to wear the tiara even after Baudouin's sudden death in 1993. I believe the 2004 Polish state visit, pictured above, was the last time she wore the piece in public, as a necklace with aquamarine center stones. Appropriately, she also wore the piece as a tiara at the Spanish state visit in 2000. It’s a good piece to have if you’re a royal woman who, like the ladies of the Belgian royal family, doesn’t have tons of tiaras at your disposal. 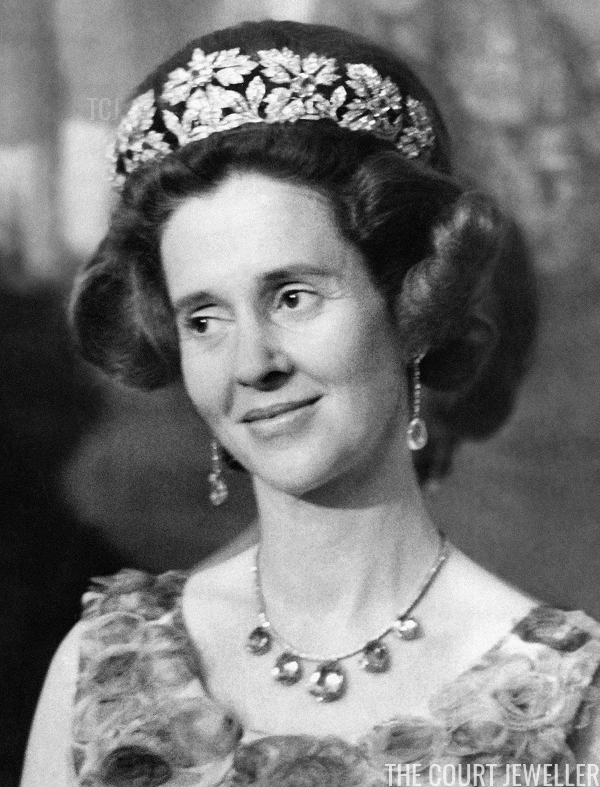 Many, including me, hope that Fabiola decided to bequeath this tiara to her niece-in-law, Queen Mathilde. 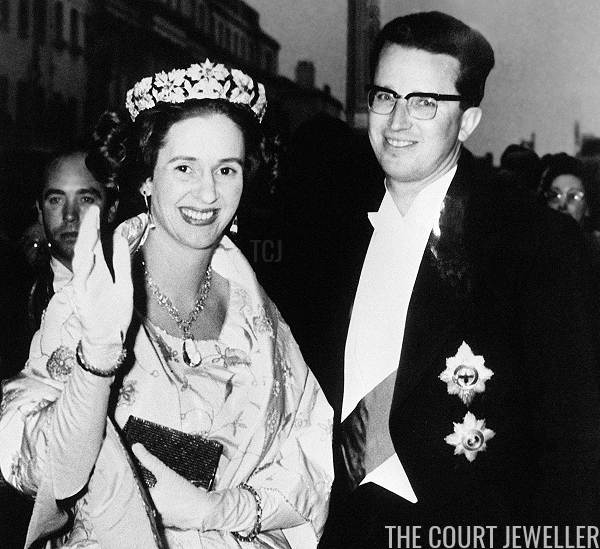 As Mathilde has been seen in several other pieces of jewelry from Fabiola’s collection, including the Wolfers Tiara, I’d say it’s a good possibility that she decided to do exactly that. 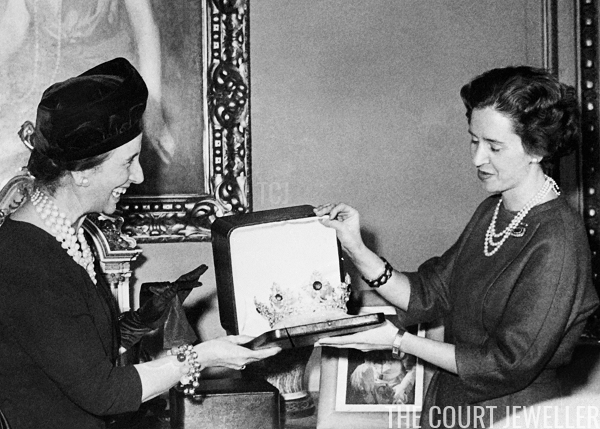 Keeping Fabiola's tiara in the family, and having it worn in public by the queen, is a wonderful way to honor Fabiola's legacy in Belgium.